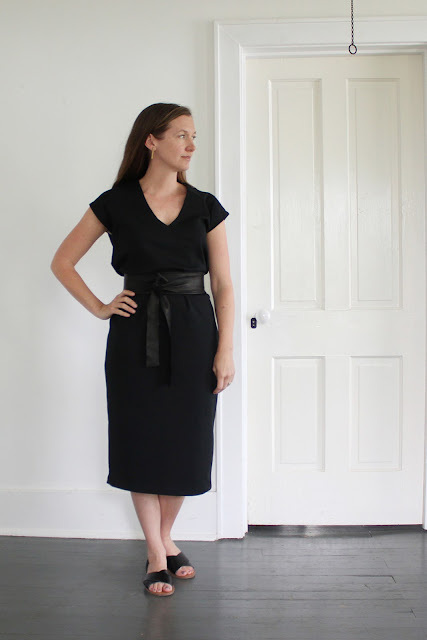 The Lodo Dress from True Bias, a modified Hemlock Tee as a Cardigan, and a self-drafted leather obi belt. Three pieces that can be mixed and matched for maximum versatility. Reflecting on Me Made May 2017, I'm feeling pretty happy with my handmade wardrobe, at least the part I shared during this month's festivities. I'm not feeling so great about the garments I didn't show, and that I don't wear. 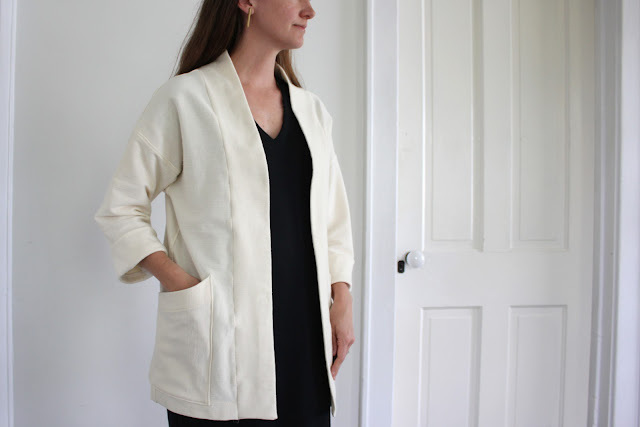 I don't do much to limit myself in what I sew, because it's important to me to try new techniques, learn new skills, satisfy my creativity, and let my personal style reveal itself. As I've become more confident with fit and technique, I want to be a more disciplined with pattern and fabric choices. I want to make clothing I know that I will wear, and that fit into the body of work I'm actually using. This spring I've been sewing with versatility at the top of my priority list. With that in mind, here are three recently made pieces combined to make four different outfits. 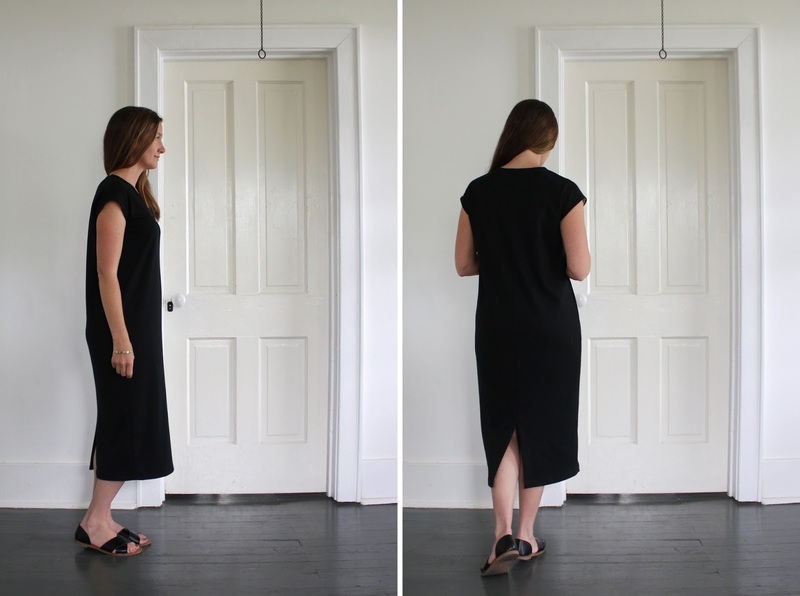 Look 1 is the Lodo Dress pure and simple. With it's deep V neck, and minimalist silhouette, a black Lodo Dress might be the must have for Spring 2017. I bought this fabric after I saw Katie's short (view b) black one. It's clearly a wardrobe staple, and I had to have one. Just before I put scissors to fabric I saw Meg's long (view a) black one. Still a wardrobe staple that can be dressed up or down, but the midi length makes it feel extra modern and sophisticated. In the end, I made the midi (view a). For look 2, I've added a cardigan extending a summer staple into cooler weather. I'm calling this my Hemlock Cardigan, because I started with the free Hemlock Tee pattern from Grainline studio. Mine is heavily modified, but with such a simple iconic shape, it's a blur where the Hemlock ends and my cardigan begins. This design is inspired by the Only Child Cardiff Work Coat that I have been mildly obsessed with since I saw it on Style Bee. It has a relaxed fit that goes well with the Lodo Dress (or jeans and a woven tank), and clever slanty pockets that are so big you can carry your keys, wallet, and phone! I hope Only Child will accept this knock-off as the sincerest form of compliment for which it is meant. 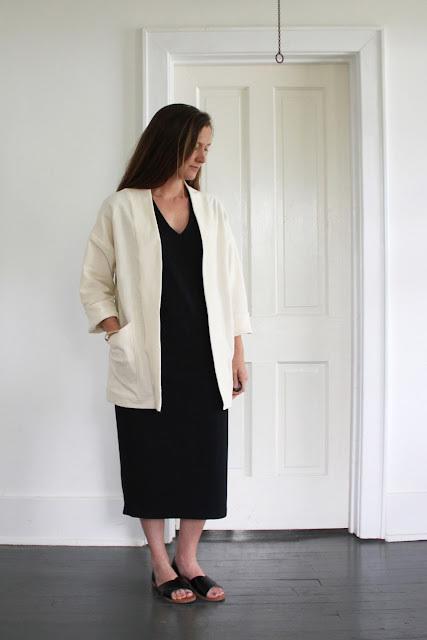 I was considering a full diagram of the alterations I made to the Hemlock Tee to end up with this cardi, but after seeing the designer herself behind the sewing machine on the Only Child instagram feed, I decided that wouldn't be fair to her hard work. As a compromise, I've got a brief written description below. There will be some trial and error unless your preferences, and measurements match mine exactly. My cardigan is made with a dream-come-true double knit I got at Jomar in South Philly. It's smooth on one side, and has a bit of texture on the other. I had no plans to make an homage to the Cardiff Work Coat until I saw this fabric. When I'm sifting through the disgusting piles at Jomar I often wonder why I bother. This. Is. Why. 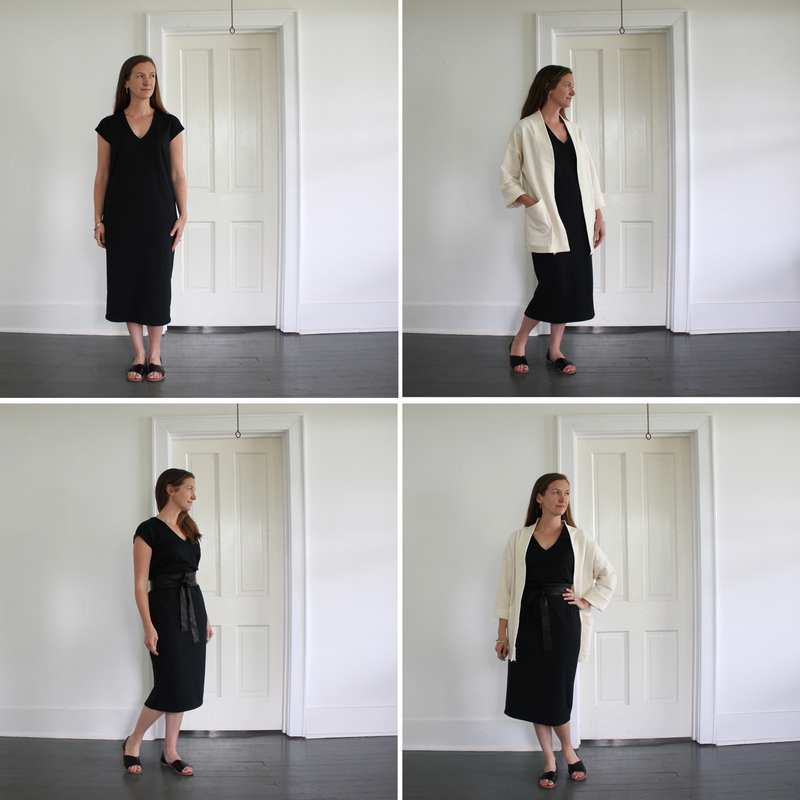 How to make a Hemlock Cardigan: Add 1" to each side of the sleeve width. Shorten the sleeve length by 2". Add 3" cuffs (actually 6" to account for folding in half) the same length as the sleeve opening. Add 1" to width of body front and back along the under arm side. Add 2" to the body length. 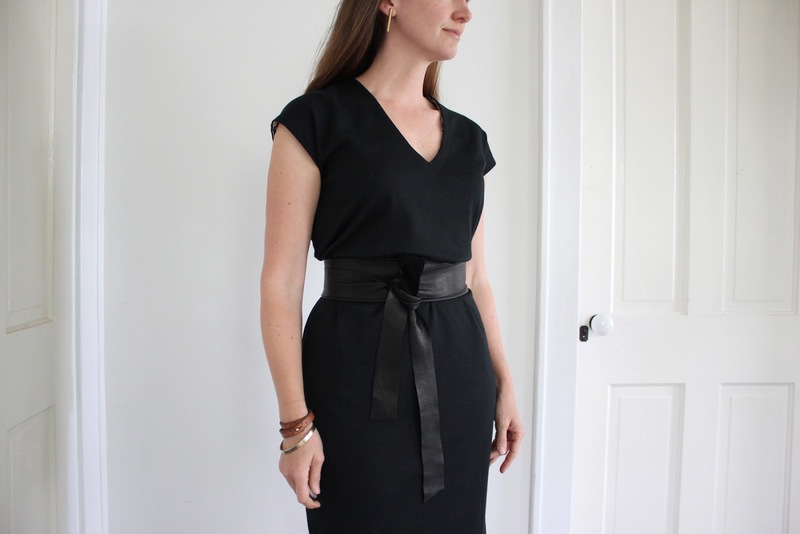 For the open front, cut from the furthest point of the neck opening down to the hem, parallel to the side seam. Use 3" wide binding (6" then folded in half) the same length as the back neck + left side + right side. Cut back as 2 pieces to add structure. Add seam allowances where required. Start bigger than you think is necessary, and baste the pieces to start. The square fit makes it easy to shave off size as you go. I normally shave a little off of the Hemlock when I'm sewing it as a tee, and I added generously to it for this cardigan. For Look 3 I've added a simple self-drafted obi belt. Sashes are prominent in indie clothing collections this spring, and as a maker of my own clothing it's an easy trend to latch on to. This version is in black leather to add some texture to the matte black dress while maintaining the visual length from shoulder to feet. In truth, I am much more comfortable in dresses with a defined waist, and have to be in just the right mood (and wearing just the right strength of shape wear) to feel comfortable in an unstructured cocoon. The leather came from Baldwin Leather & Fabric in Philadelphia's Fabric Row. Baldwin has a nice, but completely random, selection of leather in the back of their store. You pay by the square foot (it's highly subjective, but reasonably priced) so take your pattern pieces to be sure you buy the right amount. Fabric Row is on South 4th Street between Bainbridge Street and Christian Street in Philadelphia. It has a bunch of nice shops for upholstery fabrics, and a few with apparel fabric. There are enough gift shops (my favorite is Moon & Arrow) and restaurants (Hungry Pigeon and Red Hook are both solid options) to keep you busy for an afternoon. If you're in Philly, skip the cheesesteaks (actually, you can get a respectable cheesesteak at 4th and South, just a few blocks away), and shop! It's a 15 minute walk from Independence Hall through a few of Philadelphia's nicest residential neighborhoods. Look 4 combines all three pieces. I've already worn this outfit a few times, and I think it's my favorite. While I may wear my Lodo this way most of the time, I like that I can mix things up when I feel like it, or have some built in versatility for summertime travels. Wow, I really wish I could sew half as well as you, but my skills are sadly lacking and no amount of talking to my machine seems to help. Love your Obi belt and the three piece combo outfit looks great. The Lodo is an easy sew, and I did all but the seam finishes on my regular machine. Try it! Love this!! So fun to see it worn different ways. Thanks Rae! It was fun to come up with all these options! Very sensible way to sew. I'm with you on being disciplined about the clothes I make for myself. Your dress looks great, styled every way.